A new public school will be built at 664 Pacific St. in Prospect Heights. PROSPECT HEIGHTS — As work begins on a sixth residential tower at the Atlantic Yards/Pacific Park complex, locals are getting a first glimpse of the 26-story building and the public school being built on its ground floor, developers announced Wednesday. A rendering of the building, 664 Pacific St., by architect Jonathan Marvel shows a geometric facade, mostly in grayscale brick with several planted terraces and rust-colored accents reminiscent of the Barclays Center located across the street. The building, known as tower "B15" within the 22-acre Atlantic Yards/Pacific Park complex, will include more than 300 market-rate residential units and a seven-story, 616-seat public school on the first floor, said developer Greenland Forest City Partners. According to the new plan, which will be unveiled in full at a community meeting Wednesday night, the school’s entrance will be on Sixth Avenue between Pacific and Dean streets, separate from the residential entrance around the corner on Pacific Street. In addition to seven floors of classroom space — spread over five above-ground levels and two subterranean floors — the school’s design includes a 3,000-square-foot “play yard” on the building’s fourth floor and a 2,100-square-foot open space on the ground floor, located to the east of and behind the new building. The rendering shows the fourth-floor play yard on the southwest corner of the tower, partially enclosed by the facade, but allowing for access to the outdoors by way of several large, rectangular cut-outs in the brick. GFCP committed to building the school as a part of an environmental agreement made with the city in 2009. The Department of Education originally sited the school as a combination elementary and middle school, but many parents and elected officials in the neighborhood pushed the department to dedicate all 616 seats to middle school students. A DOE spokesman said no decision has been made about the use of the school as of this week. Construction on 664 Pacific St. has already begun with the demolition of three Dean Street townhouses seized through eminent domain by the state for the project, which were removed as of early this week, according to the Atlantic Yards/Pacific Park Report. An industrial building seized on the corner of Pacific Street and Sixth Avenue is set to be removed soon as well, said GFCP spokeswoman Ashley Cotton. This is architect Marvel’s first design within the Atlantic Yards/Pacific Park complex. Five other buildings under construction or set to be built soon at the Prospect Heights development are designed by COOKFOX, Kohn Pedersen Fox and SHoP Architects; an eight-acre landscaped green space is designed by Thomas Balsley Associates. The Marvel Architects firm has designed dozens of large projects all over the city and in Brooklyn, including the rebuilding of St. Ann’s Warehouse in DUMBO, the Brooklyn Heights Library redevelopment at 280 Cadman Plaza West and the new mixed-used development at 626 Flatbush Ave. in Prospect-Lefferts Gardens. 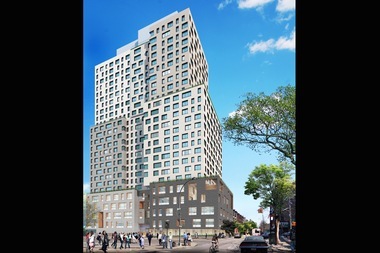 Marvel and representatives of the developer will be on hand to present the full design for 664 Pacific St. at the monthly Atlantic Yards/Pacific Park community update meeting, set for Wednesday at 6 p.m. at 55 Hanson Place. The meeting is open to the public.